Police divers have retrieved a fourth body following the ‘once-in-a-decade’ storm that began pounding Australia on Monday. 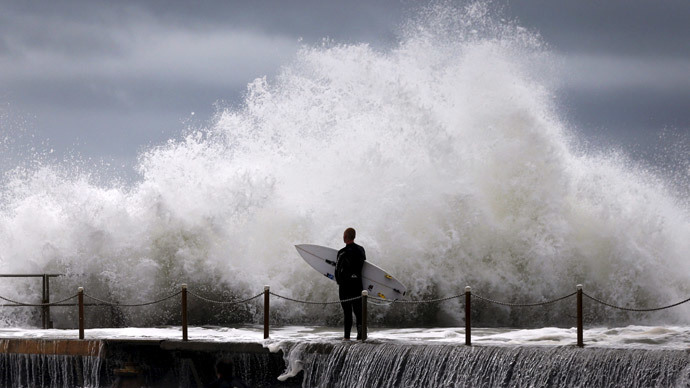 The powerful storm has destroyed homes, left 200,000 residences without power and caused damage bills in the millions. The body belonged to an 86-year-old woman who was washed away in her car at Gillieston Heights, New South Wales. It was originally believed that two people were inside the car, though authorities have now confirmed the elderly driver was alone in the vehicle. “There is no evidence there was more than one person in the car,” a police spokeswoman said, as quoted by The Australian newspaper. Witnesses watched as the car, along with another vehicle, was swept into Wallis Creek as a result of extreme flooding. The elderly driver had reportedly attempted to go around a second vehicle which had stalled in front of her. "At first it looked as if it was going to hit the bank on the Gillieston Heights side and we thought it would be alright. But then the nose went down some more and the back door came open and that was it...people dived into the water after it but it was too late,” Maitland resident Luke Butcher said, as quoted by the Newcastle Herald. Three people from the second car were treated for hypothermia. Two drivers also died in a head-on collision on the flooded New England Highway on Wednesday afternoon. "We're seeing a continuation of the wind, rain, flash flooding, and whilst it is still dangerous, the positive is that there is some easing. But we still have a lot to get through in the next 48 hours," said NSW State Premier Mike Baird on Wednesday, as quoted by ABC News. "To give you a sense of the size and scope - in Dungog there's more rain that has come down in the last 24 hours than they have seen in a 24-hour period for the past century,” Baird added. Baird said a natural disaster will be declared in Dungog, Maitland, and parts of the Central Coast in the next 24 hours. He has urged people not to enter the floodwaters. 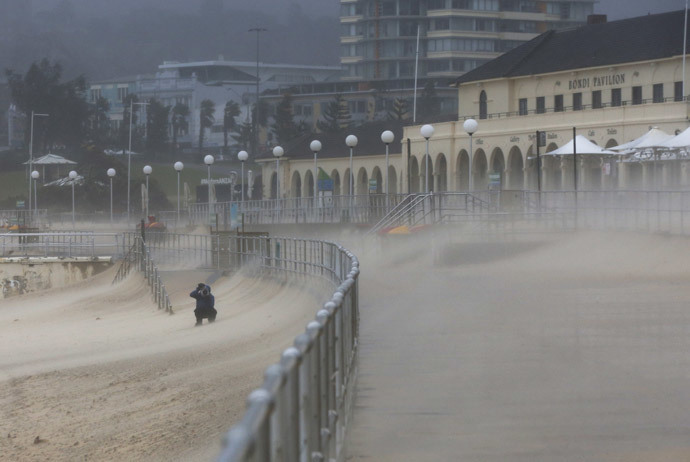 Around 100 people have been rescued from the floodwaters in New South Wales and in Sydney, the state capital, including a seriously ill baby girl. Flood warnings remain for many areas, including some around the Georges River in suburban Sydney, where residents are urged to evacuate. Sydneysiders kept their spirits up by seeing the lighter side of the drenching. This 'waterfall' Sydney Harbour Bridge is one example. Meanwhile, around 200,000 homes remain without power, and some houses have been washed away. Countless others have been damaged by trees and power lines, which have also crushed vehicles. The Insurance Council of Australia has so far received 19,500 claims. Losses are estimated at US$100 million. "I expect these numbers will rise quickly as home owners and businesses assess the damage to their properties and lodge claims with their insurer or through their insurance broker," council chief Rob Whelan said.